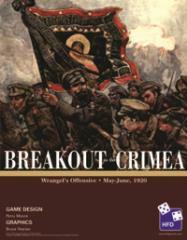 Breakout From the Crimea covers General Wrangel's Russian White Army offensive from their trapped environs of the Crimea. The game shows the technological impact of modern tanks and aircraft in warfare at the time. Wrangel's forces were not numerically as strong as the 13th Army, but their morale as well as skillful use of tanks and aircraft returned the balance of power to their favor. By May 1920, Wrangel had up to 20 operational tanks and an equal number of DH9A bombers. Their tankers and pilots trained since March, and learned well the lessons taught by their British advisors in combined-arms tactics. During the battle, both sides fought tenaciously, but it was the use of tanks and aircraft that tipped the scales.